These versatile rustic tarts are—ahem—easier than pie. Galettes are insanely versatile. Go savory or sweet. Trick out the crust by mixing in grated parmesan, finely chopped nuts, cornmeal, herbs, or vanilla sugar. Fill the tart with anything you like: brie, bacon, blackberries, lemon curd, Nutella, Swiss chard, baked eggs, white bean purée—even leftover mac and cheese. The process is super-simple. Roll out pastry dough, add a filling, then fold the dough around the edges to create a freeform tart. (If it looks imperfect, you nailed it—galettes are supposed to look a little rough.) The crust is easy to make, but also provides lots of opportunities for kids to learn baking fundamentals. Short on time? Store-bought dough is absolutely fine—you’re still cooking together! Galettes are ideal for every meal. They’re equally tasty hot, cold, or at room temp—for a quickie breakfast, lunchbox fodder, an afterschool snack, or elegant-ish family dinner. Loaded with creamy ricotta and drizzled with honey, our sausage and delicata squash galette is one your crew can—and will—eat all day. Sweet, tender delicata squash is in its prime right now … do yourselves a favor and dig in. Galettes are one of those dishes you either adore or have never heard of (until you try one and become obsessed). They’re also a great recipe to make with your kids. Loaded with creamy ricotta and drizzled with honey, our sausage and delicata squash galette is one your crew can—and will—eat all day. Sweet, tender delicata squash is in its prime right now … do yourselves a favor and dig in. Make the crust: Pour the flours and salt into the bowl of a food processor, and pulse a few times to combine. Add the cold butter and pulse just until the mixture has pieces that range from coarse crumbs to pea-size (you want some chunks of butter remaining). To mix by hand, whisk the dry ingredients together in a large mixing bowl, then cut in the butter with a pastry blender or two knives. 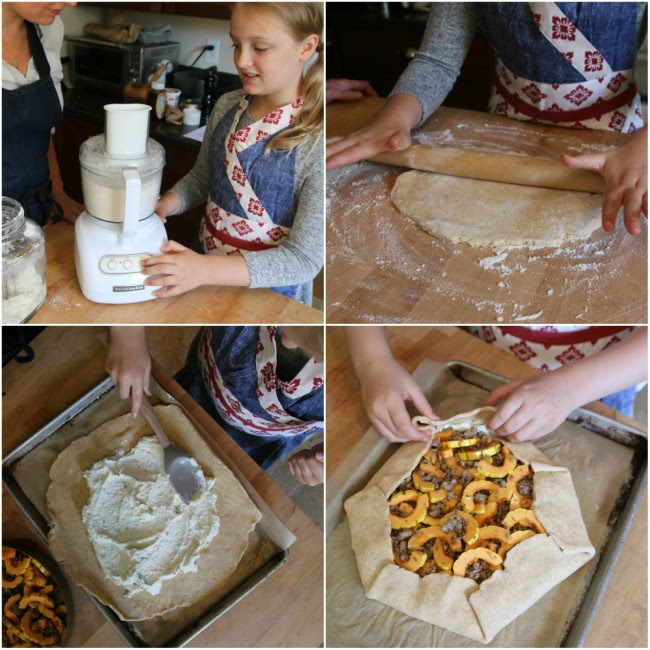 Making this crust is a great opportunity to teach your child how to measure flour correctly. First, use a large spoon or whisk to fluff the flour in its bag. Next, rather than scooping the flour from the bag with your measuring cup, gently spoon the flour into the cup, filling it a little higher than the brim—do not pack the flour in or tap the cup to make the flour settle. Finally, use a knife or the handle of a mixing spoon to sweep the excess flour off the top. With the machine running, slowly add the ice water through the feed tube in a steady stream, just until the dough comes together in a shaggy ball. Don’t over-process or add too much water—the dough may still be a bit crumbly, but you should be able to bring it all together with your hands. Transfer the dough to a lightly floured work surface and pat it into a smooth ball. Using a floured rolling pin, roll the dough out into a 15-inch circle (it can be ragged) about 1/8-inch thick—occasionally rotate the disc to prevent sticking, and dust the pin with additional flour as needed. 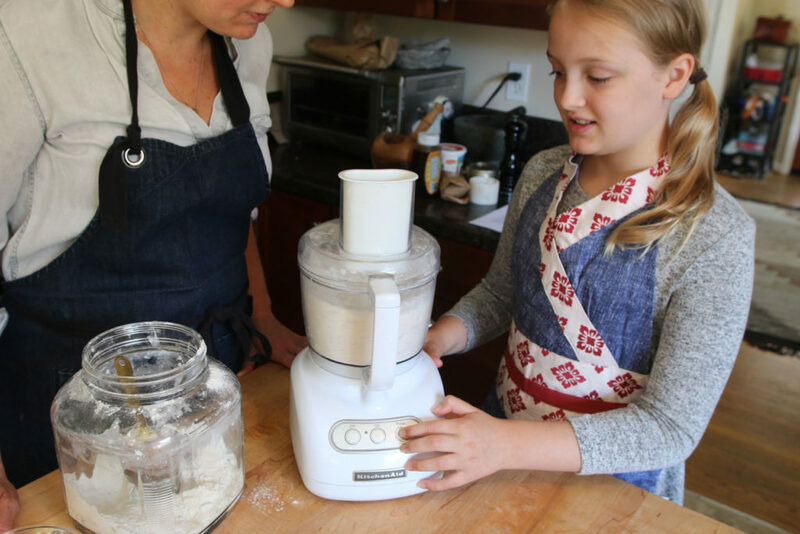 Younger kids will likely love pressing buttons on the food processor, adding ice water, and rolling out dough. That said, these tasks also have a fundamental impact on how your crust will turn out. Assist your child as needed, explaining the reasons why. And no biggie if it ends up less than perfect—just add a little extra honey or sprinkle of parmesan on top, and try, try again. Line a large-rimmed baking sheet with parchment paper. Roll the dough up loosely around the rolling pin, then unroll it onto the parchment paper. Loosely fold in any overhanging edges, cover tightly with plastic wrap, and place the dough in the refrigerator until cold and firm, at least 30 minutes and up to 3 days. When you’re ready to make your galette, preheat the oven to 400˚F. Teach your kiddo the “why” behind kitchen tasks you typically do on autopilot—like preheating an oven. The short version of Food52’s great explanation: Time and temperature are key variables in all cooking. For baking, in particular, a hit of heat right from the start is what kickstarts leaveners (yeast, baking powder, baking soda) and triggers the expansion of trapped air and/or moisture that produces a crust’s flakey texture, a muffin’s fine crumb, or a cookie’s tender bite. From biscuits that don’t rise to cakes that are raw in the middle and burnt on top, starting with an oven that’s not fully preheated gets everything out of whack. Make the filling: Heat the oil in a medium skillet over medium-high heat. Add the sausage and cook until browned, about 5 minutes. Remove the pan from the heat and stir in the squash. Season with 1/2 teaspoon salt and set aside. Unwrap the dough and let it warm up for a few minutes so it’s pliable and won’t break when you fold it. In a medium bowl, combine the ricotta, honey, oregano, and the remaining 1/4 teaspoon salt. Spread this mixture in the center of the dough, leaving a 2-inch border. Scatter the sausage-squash mixture in an even layer over the ricotta. Fold the edges of dough over the filling, overlapping every 4 inches or so to create a pleated crust. Lightly brush the crust with the beaten egg. Brushing an egg wash on raw dough right before baking helps seal edges, enhances the crust’s golden hue, and adds shine. It’s also fun! Don’t have a pastry or basting brush? You could use a new, clean paint brush, paper towels, leafy greens, fingers, or anything else your child can think up. Bake the galette until the crust is browned and crisp, 40 to 45 minutes. Remove it from the oven and immediately drizzle generously with honey. Serve warm, room temp, or cold, cut into wedges. Make ahead: Refrigerate the galette in an airtight container for up to 3 days. To freeze, cut the galette into slices, wrap each piece individually in plastic wrap, pack in a zip-top freezer bag, and freeze for up to 1 month. Reheat the slices in a 350˚F oven for 8 minutes if refrigerated, or 15 to 20 minutes if frozen.